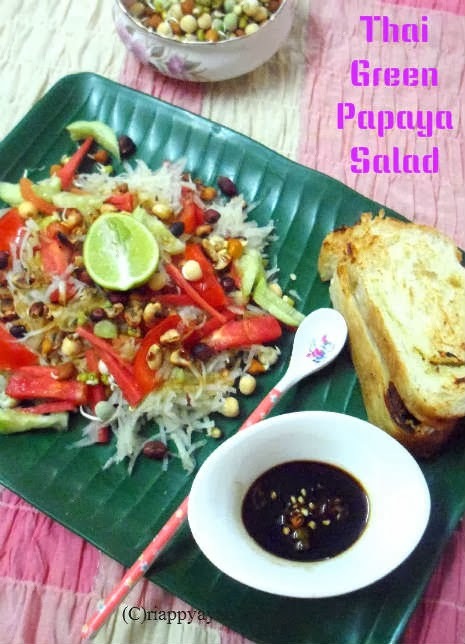 This green papaya salad, also known as "Som Tam", is very much popular not only in Thailand but also all over the world. It's because of its uniqueness of ingredients and dressing. It's not only very nutritious but also easy to make and low-calorie salad dish which goes pretty much with any food from any cuisine and can be consumed any time of the year. Literally, if you are having Indian Chicken dish, will go very well with it or having Italian pasta, will also fit with pasta. 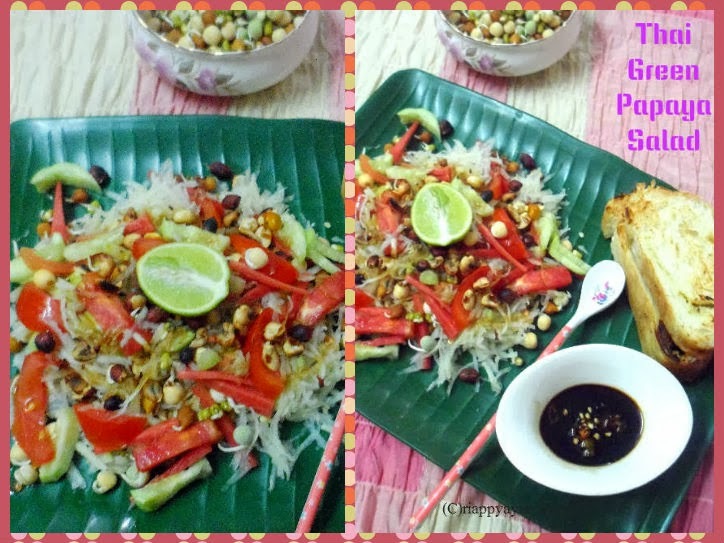 The star/main ingredient in this dish is green papaya, it is finely shredded and authentically, some bean sprouts, green beans and tomatoes are also added. Another key ingredient is roasted peanuts, it gives a special crunch to this salad. A dressing is prepared using fish sauce, dried shrimp paste and palm sugar/brown sugar. Vegetarians can substitute the fish sauce and dries shrimpl paste with Soy sauce and brown sugar or honey. Shrimp paste/fish sauce/soy sauce : 1/2 tsp. Brown Sugar/honey : 1 tblsp. Fish sauce/soy sauce : 1 tblsp. Take all 'Dressing' ingredients together in a cup. Make sure shrimp paste and honey dissolve fully. I didn't get either fish sauce or shrimp paste in my locality, so I replaced them with 1 tblsp. soy sauce, lime juice, honey and green chillies. Adjust the taste adding more or less honey or chillies according to your taste. Set aside. Roast raw peanuts on a hot tawa for about 7-8 minutes or until black spots appears on them. Cool them and then take the skins out just rubbing them on your palm. Set aside. Peel the green papaya, then slice it in half and use a spoon to scrape out the seeds. Using a grater, grate the papaya, or you can use a potato peeler to create thin, ribbon-like strips. Place in a large bowl. Add sliced tomato, cucumber, bean sprouts/sprouted green grams, green beans (if using), shrimp or tofu (if using). Pour over the dressing, tossing well to combine. Add nuts and toss again. 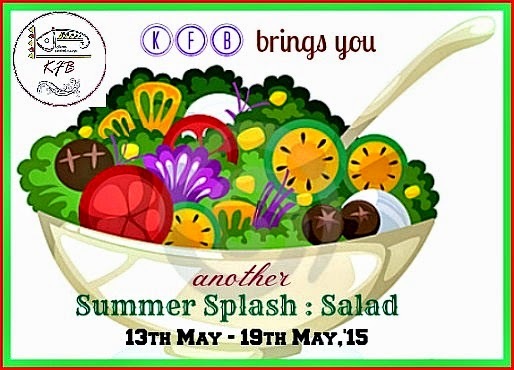 This salad goes to Kolkata Food Blogger's Summer Splash : Summer Salad event. Delicious green papaya salad. love thai dishes a lot.